Risk Assessment Services | BlackHatWing, Inc.
Are you concerned about your business security threats and want to know the risks involved? With rapidly evolving technology, new threats are mushrooming every day and organizations knowledge base around their threat scenarios are often left obsolete. It is imperative that an organization has a robust and impenetrable IT architecture to support various technological implementations as well as securing vital information. The global outreach of businesses require state of the art networks and architectures that are secure on both local and wide area. A strong foundation is established and supported through a combination of security products, secure computing environment and well thought out policies. Why Risk Assessment Services? every business firm has to make it sure that all of their installed procedures and frameworks are perfectly safe from any kind of security lapses and loopholes. 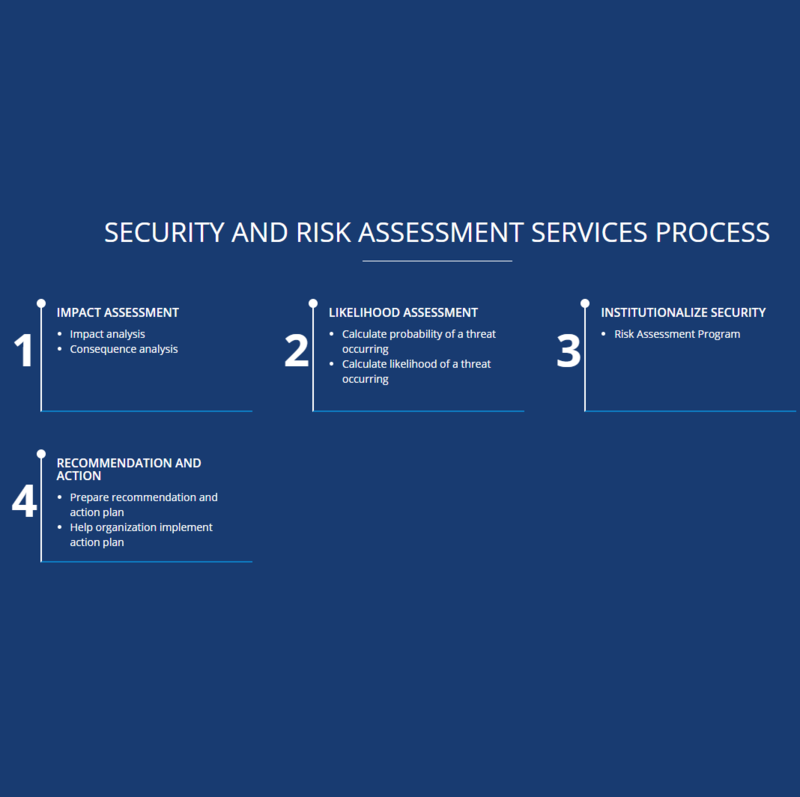 Info security and risk assessment services play a significant role in sustaining overall security. The baseline requirements are intended to create a minimally acceptable security standard for all the IT departments on campus. Info security & risk assessment procedures help to highlight the most pertinent themes that every IT depart will put on their list of security priorities. Info security & risk assessment services offer remediation guideline facility for the identified vulnerabilities in any type of testing. Risk assessment services allow businesses to assure overall security standards in an organized and reliable fashion. BlackHatWing offers expert review of security architectures along with the design service to ensures a robust, cutting edge and effective security built into your network from a vendor neutral point of view and in depth defense strategy. A vendor solution working for one company may not work for the other. Our approach involves assessment of your infrastructure, recommending solutions and designs that will work best for your business needs by working with the technical and business managers. Kualitatem assists in developing and establishing policies and procedures, conducting baseline security reviews, establishing security roadmap and assist in remediation guidance. BlackHatWing have wide range of security experts and solutions vendors such as IBM, HP, Symantec, McAFee to name few, to consider the enterprise security issues that will define the next 12 months. They can highlight the most pertinent themes that every IT department will need to put on their list of security priorities, and how client need to prepare for the challenges ahead. The world faces an acute shortage of cyber security professionals who are adequately skilled for today’s threat landscape.According to security experts, in coming years Information security will feel the effects of this shortfall more than ever, resulting in yet more spectacular data breaches, (as it will be several uncomfortable years before supply meets demand. BlackHatWing offers remediation guideline facility for the identified vulnerabilities in any type of testing. Dealing with critical vulnerabilities in timely fashion is what is needed. (We take remediation phase of much more importance) and always suggest a retesting of vulnerabilities after patching in order to verify that they are properly patched up. Capacity building strengthens the knowledge, abilities, skills and behavior of individuals and improves institutional structures and processes such that the organization can efficiently meet its mission and goals in a sustainable way. BlackHatWing believes in educating their Clients and building their strength for solving problems and serving their business needs. In the past we have developed and delivered the following trainings independently as well as part of the auditing assignments. CISSP is a fine choice for security personnel or for those who wish to pursue their career in security field. The course is designed to train individuals in information security for the highly acclaimed information systems security professional. The goal of the BlackHatWing’s CISSP 5 day training seminar is to prepare professionals for the challenging CISSP certification exam, covering the objectives of the exam as defined in the (ISC)2 Common Body of Knowledge. CISSPs are expected to have a broad range of skills across security policy development and management, as well as technical understanding of a wide range of security controls across all disciplines within information security. Our CISSP bootcamp will provide you with a quick and proven method for mastering this huge range of knowledge. At BlackHatWing we believe in enabling our customers’ resources for the ever evolving and increasingly challenging security arena. For this, we offer various specific training courses. One of them is Ethical Hacking and Penetration Testing. Security Is becoming important and decision makers are realizing its role in providing smooth and secure services. Gone are the days when investment in information security was considered an extra topping and simply a luxury. Now it has become an integral part of every business. Keeping in view the current business requirements and a high market demand we have developed a program for skilled information security professionals who can really perform “Vulnerability Assessment and Penetration Testing” on their systems. They can find and remove security weaknesses before a malicious person or a hacker finds them. This training program is aimed at teaching and delivering the real world knowledge on the subject of “Ethical Hacking & Penetration Testing” using same tools, techniques and methods that are used by hackers to target a business IT infrastructure. It gives IT Security Professionals a leverage and helps businesses improve upon their security postures by finding and removing vulnerabilities before the bad guys find and exploit them. Participant well be trained on variety of tools such disassembler, a debugger and other tools for malware analysis. This course is intended for forensic investigators, incident responders and malware specialists to reverse-engineer malicious software using practical tools and techniques. Our pool of certified professionals provides trainings to IT professionals and employees with access to sensitive information to better educate them about the risks of social engineering and how to prevent themselves from falling prey to risks posed by competitors or malicious intruders. These seminars are dedicated to preventing human error from undermining an otherwise robust information security infrastructure. These programs are geared and developed according to your needs and degree of risks associated with naïve and/or malicious use.